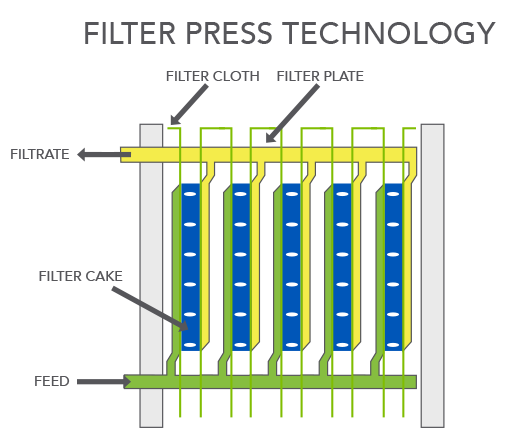 CRS Filter Press Technology can be installed as either an inline or batch operation. This technology is used to separate liquids from solids in slurry applications. As the slurry enters the CRS Filter Press, it is separated into its base liquid and dry material under pressure. Once the slurry is fully loaded in the chamber, a hydraulic pump applies a load to compress the plates which expels the excess fluid and forms a dry cake on the plate that can be discarded. As the cake builds up on the plate surface, fine particulates are removed from the process fluid. The process fluid can be now be reused for further operation, thereby decreasing your operating costs. CRS has operated this technology for more than 20 years and understands what pressures are required, the filter press surface area size and flow rate to achieve the required specification. 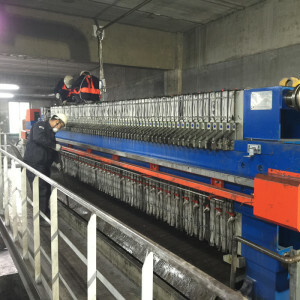 The Filter Press offers our customers an economical alternative to other filtration technology, however it does require additional manpower to operate, depending on the level of automatic controls that are installed or specified.